The Incas built a highly advanced network of nearly 40,000km of trails to connect the distant corners of their vast empire, stretching from Quito in Ecuador in the North, to Santiago in Chile in the South and Eastwards to Mendoza in Argentina. At the heart of this great empire was the magnificent city of Cusco. Almost all of the main trails in the mountains surrounding Cusco were either built or improved upon by the Incas. The fact that many of these trails still exist today, almost 500 years later, is testament to the engineering acumen of this ancient empire. 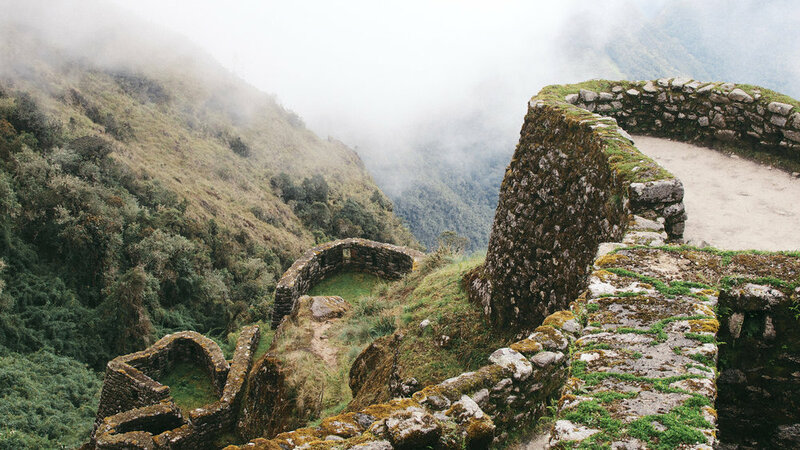 A particularly beautiful 43km section of mountain trail connects the important Inca archaeological sites of Runcuracay, Sayacmarca, Phuyupatamarca, Wiñay Wayna and Machu Picchu. Having grown in popularity with hikers over the last 30 years this trail has become known simply as the “Inca Trail to Machu Picchu." It is now without doubt one of the most famous walking trails on the Planet, and draws thousands of visitors every year. We are delighted to be able to offer this thrilling itinerary to take you on this journey of a lifetime. Trekking deep into the Andes, we will make challenging ascents to take in the most spectacular views of the mountains and valleys. We will walk amongst the flora and fauna that is so unique to this area of Peru, perhaps walking side-by-side with wild Alpacas, or even seeing the mighty Condor soaring overhead. We will have plenty of time to visit the incredible ruins that line the trail, many of which are only accessible on this particular itinerary. And of course, the jewel in the crown of any Inca Trail itinerary is our arrival at the Sun Gate of Machu Picchu and our full guided tour of this ancient Citadel, recognised as one of the new 7 Wonders of the World. You will be accompanied at all times by one of our professional guides, all of whom are experts in the archeology and environment through which the trail passes, and they will share stories of the history of the incredible sights with you along the way. They are also highly experienced mountain trekkers and will ensure your safety at all times. Camping deep in the majestic Andes is an experience of a lifetime, and we pride ourselves on making your camping experience as comfortable as possible, without taking away from the rugged nature of a trek in the mountains. Access to the Inca Trail is strictly controlled and only authorized trekking companies are allowed to sell this trek. All guides must be properly licensed and only a limited number of trekking permits are issued and must be purchased several months in advance (see Inca Trail Permit Availability). At Vicuña Adventures you can be assured that you are in the hands of a fully licensed, highly respected tour company. So we invite you to join us for the most unforgettable experience on this journey of a lifetime! 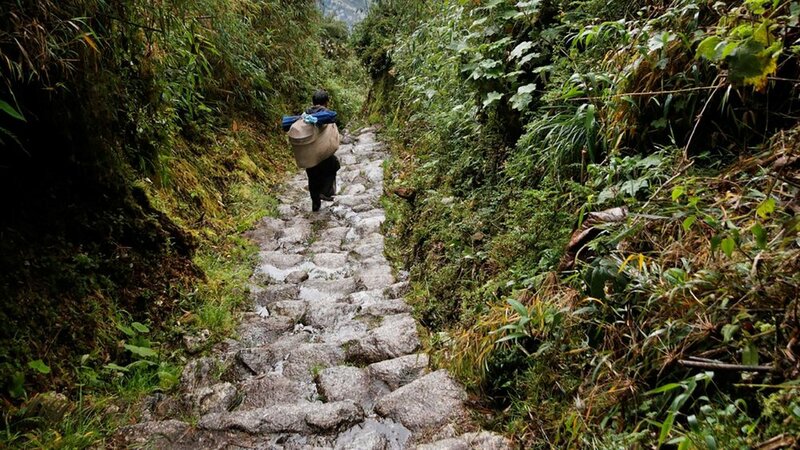 The first day of the Inca Trail is easy going to help you settle into the trek. Covering 14km of the trail gently up the Cusichaca Valley, you will pass by the Inca site of Llactapata, enjoy great views of the snow-capped peak Veronica (5900m / 19000ft) and get to see a variety of native plant life and birds throughout the day. Our campsite for the night is at Ayapata (3300m / 10829ft) which is a little further along the trail than most groups go. As we’re camping further up the trail, the next day’s trek up to the pass is a little easier for us and with fewer tourists at the campsite we can enjoy the peace and quiet of this beautiful place. Today is considered by many to be the hardest day of the trek; with 2 high passes (Dead Woman’s Pass is the highest at 4200m / 13779ft) to cross and nearly 16km to walk, today really tests your spirit. There’s no need to worry though, thanks to our enthusiastic guides and team of porters, helping you along, you’ll have all the moral and physical support you need to make it. Today we get fantastic views of the high mountain ranges as we cross the 2 passes and will have the chance to visit 2 Inca sites (Runcuraccay and Sayacmarca). We will also see a variety of plant and life in the Polylepsis forests that cover this area and hopefully spot White Tailed Deer as we near Dead Woman’s Pass. Our campsite tonight is at Chaquicocha (3600m / 11800ft) which like Ayapata is one of the quieter campsites and affords beautiful views of the sunset over the mountains in the distance. Having made it over the 2 passes yesterday we are now treated to a relaxing day through some of the most beautiful scenery the Inca Trail has to offer. With a relatively short distance to cover, what is known the Inca Flat (gentle ascents and descents), we get to enjoy the lush and verdant cloud forest around us and the spectacular views of the Andes in the distance. With visits to 2 Inca sites (Phuyupatamarca and Winay Wayna) this is by far one of the most impressive days of the trek. Our campsite for tonight is at Winay Wayna (2680m / 8792ft) which we will arrive at early afternoon and get an extended guided tour of when we have settled in. Today is the highlight of the trek. Upon arrival to Machu Picchu you will have a 2 hour guided tour of the site during which you will learn about the Incas and visit all the most important areas of the citadel. After your tour you will have free time to explore the site by yourself and if you trek either Huayna Picchu or Machu Picchu mountain. In the afternoon you will take the train back to Ollantaytambo and from there you will catch a bus back to Cusco. All transfers, private van to trailhead at km 82, bus from Machu Picchu to Aguas Calientes, and private van from Ollantaytambo to your hotel in Cusco.